View our holiday theme page for all holiday ideas. 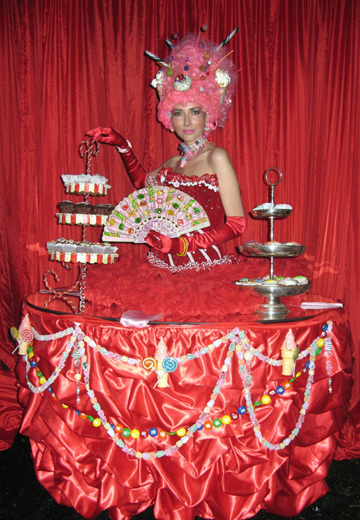 Holiday Human Tables Our beautifully customized, costumed Human Strolling Tables will be the hit of your next event. We can customize for any theme. Our actors mingle with your guests while serving beverages, hors d'oeuvres, desserts, handing out brochures, samples or giveaways, demonstrate your product and answer questions. Mirror Dolls A combination of glass and mostly plastic mirrors cover the entire costume. This highly reflective performer turns into a human mirror ball. Put them on a pedestal, light them from above or below and watch them glow reflecting the colors of the lights and and surrounding area. 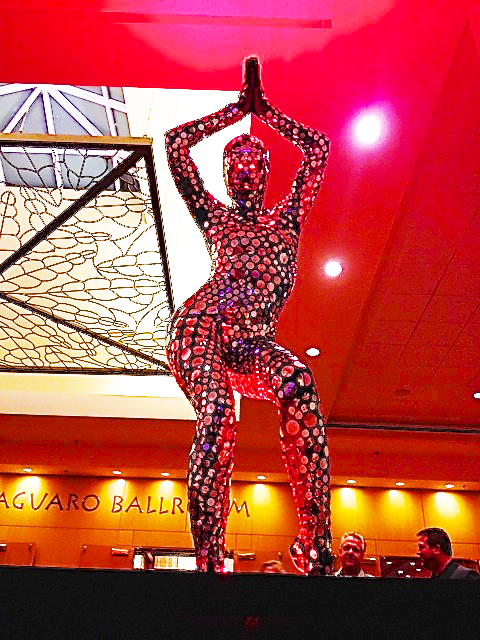 These Mirrored Dolls pose in stylish ways and make for a truly artistic performance. 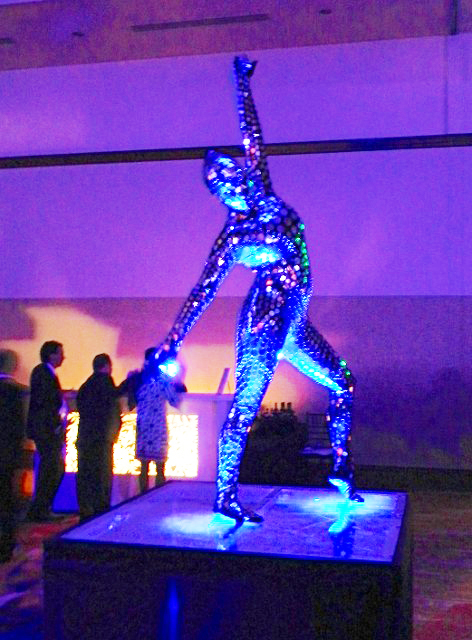 Your guests will be intrigued and fascinated by this human light show. Holiday Rockettes This joyful team of Santa's helpers will perform a 15 min. choreographed showcase with routines such as a Rockettes kick line, Jingle bells cabaret style performed with chairs, a ballet solo from the Nutcracker, a Candy Man routine with a tap solo and more. As Santa Helpers, they can pass out gifts to all your guests and mingle with atmosphere dancing. They can perform Santa Baby improv with the host of the party dressing him up as Santa. 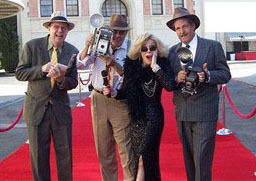 Paparazzi Make your VIP guests feel just like famous movie stars when greeted by our team of ravenous reporters at your next event. This talented troupe of improvisational actors have been respected favorites of Hollywood's biggest studios and best event venues. Visit our online entertainment catalog for photos, videos, music and descriptions. eNewsletters are sent approximately 6 times per year.